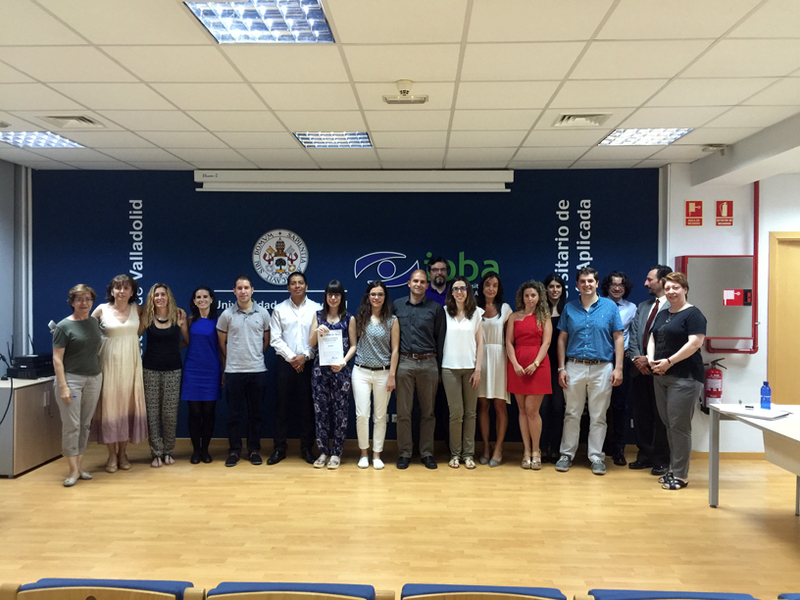 The first Predoctoral Research Day in Vision Sciences was held on 29 June 2016 in the University of Valladolid. Thirteen researchers presented their PhD projects to students and lecturers. 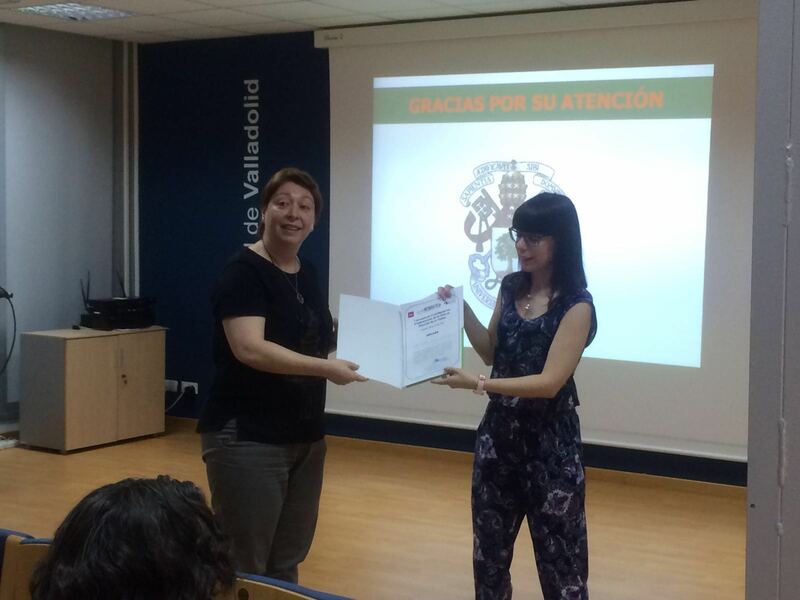 The presentation of Sara Ortiz Toquero (Optometry Research Group – IOBA) entitled “Development of a clinical guideline based on evidence for gas permeable contact lenses fitting in patients with keratoconus” was selected by the panel of lecturers as the best of the Research Day. Sara Ortiz presented her PhD project including the development of CALCULENS.COM. Sara Ortiz and Guadalupe Rodriguez (Optometry Research Group – IOBA) have presented two studies related with GP contact lenses fitting in the 24 Congress of Optometry, Contact Lenses and Ophthalmic Optics – OPTOM 2016 in Madrid (8 to 10 of April, 2016). 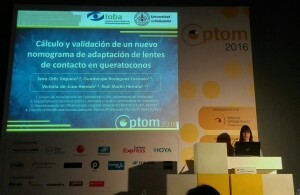 Sara Ortiz, presented preliminary results of her doctoral thesis in the oral communication entitled “Calculation and validation of a new nomogram to GP contact lenses fitting in keratoconus” that described the standardization of GP lens fitting in keratoconus eyes. 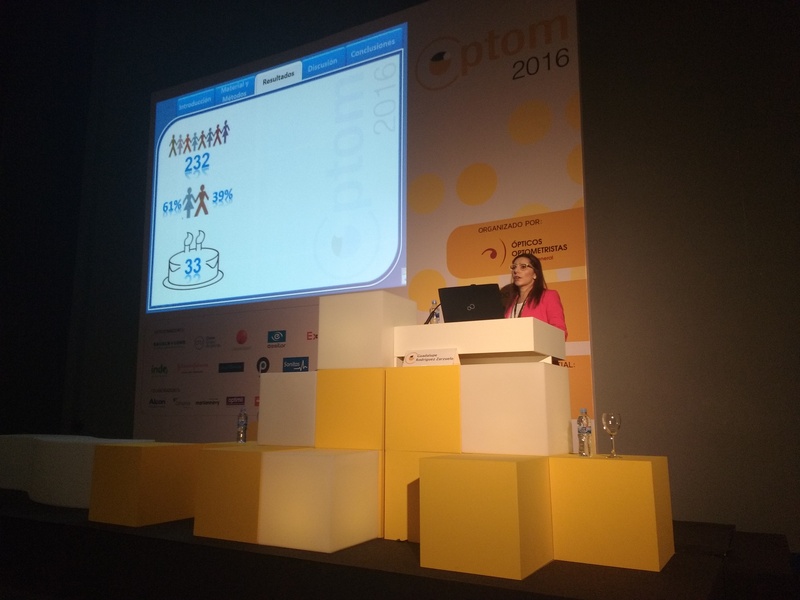 Finally she presented the CALCULENS.com online tool to help Contact Lens Practitioners. Meanwhile, Guadalupe Rodriguez presented the communication entitled “Success of Rigid Gas Permeable Contact Lens Fitting” that analyse the percentage of successful GP lenses fits in healthy subjects (refractive prescriptions fitted for only refractive reasons) and in special subjects (fitted with a therapeutic objective). The results of this project shows that 70% of healthy patients that start a GP fitting procedure have accepted this type of contact lenses to correct his/her myopia, hyperopia or astigmatism. This percentage raised to 90% when GP lenses are fitted in patients with irregular cornea. 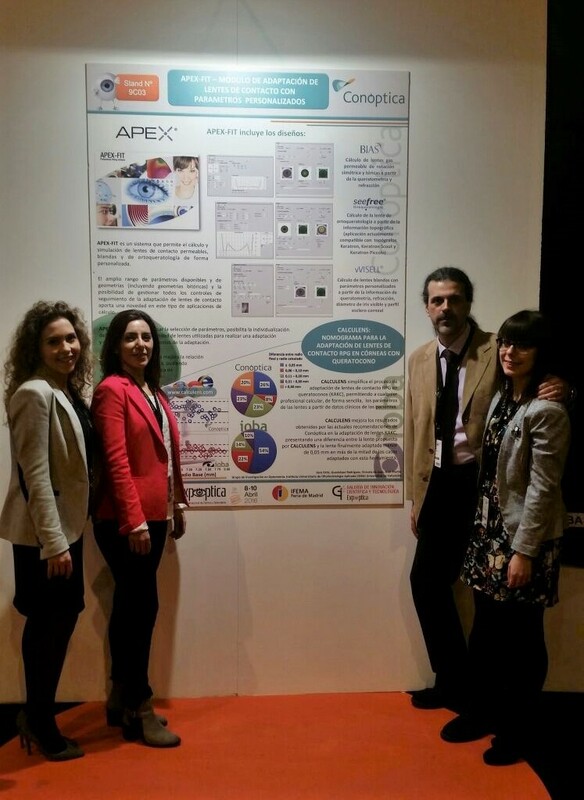 CALCULENS.COM has been presented in the 1st Gallery of Scientific and Technological Innovation of the 31st edition of Expoóptica held in Madrid from 8 to 10 April, 2016. The aim of this Gallery was to contribute to a better understanding of the optical sector innovation, both by companies and professionals, and by society in general. 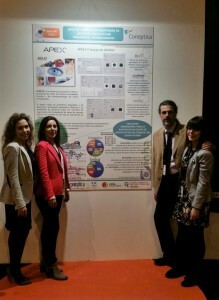 The nomogram for GP contact lens fitting in keratoconus included in CALCULENS.COM was presented in collaboration with Conóptica company and their innovation project “APEX-FIT: Fitting of contact lenses with custom parameters”. At last, we are here! See you soon in next posts.